Children are involved in several ways at various times in our worship services throughout the year. If parents bring their children to worship, the children are regularly exposed to messages crafted especially for them, each of which mirrors the theme of the respective sermon message for adults to be presented later in the service. During the summer months, the older-elementary-age children act as readers during our 9:30 traditional worship services as part of the GREEN Team experience. 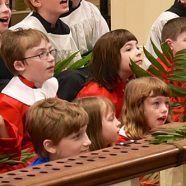 During special days, like Christmas Eve and Palm Sunday (or Sundays in which scouting ministries are recognized), children take part in the worship service in unique ways. We do this because we value children and that they, too, have a voice and something to teach us. Above all, we want children to know that God loves them.